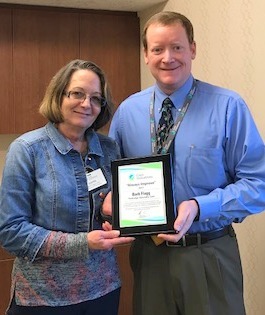 Barb Flagg, admissions coordinator at Parkridge Specialty Care in Pleasant Hill, received the Care Initiatives Always Improve Award at Care Initiatives’ annual awards brunch Friday, Dec. 15 in West Des Moines. The award is given to a Care Initiatives employee who embodies the company’s core value to always seek out ways to improve quality in every way. The “Always Improve” award is one of six Core Value Awards given to a nominated employee throughout our statewide organization of 3,000+ employees.